Text and photography copyright Ganesh.H.Shankar. All rights reserved by the author. Landscape photography needs no introduction. Thanks to digital revolution, people these days use mobile phones to large format cameras to make images of beautiful landscapes of mother nature. Landscape photography often involves making images of a grand natural landscape in front of us. How much of wide scene (angle of view) we can capture is determined by the focal length of the lens (measured in millimeters (mm)) we use on our cameras. It is said that angle of view of human eyes is approximately equivalent to that covered by a 50mm lens in traditional film cameras. This range gets covered today in most of the affordable cameras – be it point-and-shoot camera or an SLR camera with not-so-expensive wide angle lenses. Unlike wildlife photography, good thing about landscape photography is quality equipments are afforable. Below image shows some of the wide angle lenses and camera systems that can be used for landscape photography. Though some of these are lenses/cameras made by Nikon you get similar focal length lenses and similar cameras from other manufacturers too. The below image shows kind of camera system people use depending up on how serious they are about landscape photography ! Note the relative sizes of point-and-shoot vs. a digital SLR vs. a large format (4×5) camera systems. With that short introductory note let us let us go over a bit more of science and art of landscape photography. Scape means an extensive view – landscape means an extensive view of a scenery in general. Focal length of a lens determines the angle of view or amount of scenery that gets covered. Shorter the focal length of the lens, more is the area that gets covered. For example, a 24mm lens covers wider area compared to 28mm lens. As mentioned above the area covered by human eyes is approximately equivalent to that covered by a 50mm lens used on traditional film cameras. What this means is, if you use a lens having focal length less than 50mm, then, you can capture wider area than what you can see. Typically, ideal focal length of a lens for landscape photography may start at 20mm-24mm in a 35mm SLR camera format and may go up or down depending upon the taste and style of a photographer. Thanks to digital revolution plus choices of film/slide, there are different camera systems avaiable today in the market for landscape photography. This ranges from built in camera within cell phones to point-and-shoot digital cameras to digital SLR cameras to the so called full frame (35mm) digital SLRs to traditional film/slide based SLR cameras to medium format film cameras to medium format digital cameras to large format cameras! The main difference in these choices being quality of the image captured on the recording medium – digital sensor, film or slide. Bigger the sensor/slide/film better is the quality. Quality of images that we get from todays digital cameras are directly proportional to two important parameters – size of the sensor used within the camera and number of pixels (or Mega pixels) supported. Unfortunately, size of the sensor is normally not talked about at all and people rely on mega pixel comparisons. For example quality of the image that we get from 8 mega pixel point-and-shoot digital camera may be far less compared to say 5 megapixel SLR digital camera. This is because each pixel within the SLR camera’s sensor is much larger compared to the ones used inside point-and-shoot camera. Larger sensors provide better signal-to-noise ratio and hence better image quality. So it is important not to get fooled by number of mega pixels alone when we make a buying decision of a camera system for landscape photography. To give you a feel of relative sizes of these sensors used in different format cameras see the picture below. They don’t represent actual physical dimension but are relative sizes. Being a scape, landscape images often look best as very large prints. To make very large print, we need a very high quality image to start with. As discussed above, very high quality image needs very large sensor and number of pixels or a large film or slide. So for serious landscape photography professional landscape photographers often prefer using a large format camera or a medium format camera with digital backs. There are several choices available today. People may consider buying medium format cameras like Hasselblad and buy digital backs for them or consider using a slide/film based large format cameras. As of writing this (June 2009) large format digital backs are very expensive (thousands of dollars or more). On the other hand, large format cameras like the one shown below is relatively much cheaper but needs lots of experience in terms of handling. They come in different sizes and take different types of slides and or film. 4×5 (4 inches by 5 inches slide/film) format is most commonly used large format system. However, well known landscape photographers like Ansel Adams relied on even larger format system (8×10) to get best possible quality. 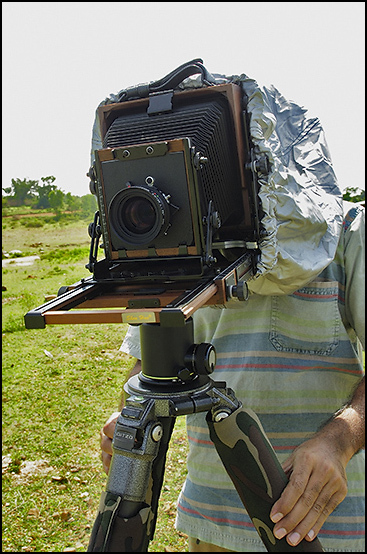 Here is an image of a photographer using 4×5 large format camera ! Like to buy one ? 🙂 If you are fanatic about image quality probably you would ! These large format cameras give maximum flexibility in terms of different movements to control the depth-of-field (region of perceived sharpness) – lens can be tilted backward or forward (tilt) or sideways (swings) which is not possible in any other camera formats. This gives excellent control over depth-of-field. But handling and composing using this camera needs lots of experience. For example one would need a dark cloth and magnifier to manually focus the lens in field. There is no electronics there in those boxes. All controls are manual. Exposure has to be very accurate and we would need an incident light meter. Exposing one sheet of film/slide may take as much as 15 minutes or more. Exposure error means loss of about Rs. 600/- (12 USD ballpark numbers) plus lots of wasted time. One need to get used to seeing the image inverted in the view finder while getting the required composition ! While it is a joy to use getting these large slides/films processed is becoming increasingly difficult these days – more so in India. That would leave us with digital SLR cameras as next choice for landscape photography. You would not go wrong buying either a Nikon or Canon sporting about 12 mega pixels and a wide angle lens covering the range 24mm to 120mm. Of course a good tripod and a ball-head (a supporting system on which camera is mounted on a tripod) gives you best sharpness and enable larger prints. While these digital SLRs have much smaller sensors compared to digital backs or 4×5 inches slides multiple frames can be stitched together in software like Photoshop to get larger panoramic images to make a landscape print or an image. For example the first image in this article is a stitched image of multiple verticle frames. So is the below one. If one is not all that serious about image quality of course we have a variety of point-and-shoot digital cameras to choose from which are relatively priced less. With that short note on different equipements used for landscape photography let me share some of my thoughts on art of nature photography. Unlike in any other field of arts, the first question people ask when they see a unique image is “what camera/lens you use?” This is an embrassing question for an experienced photographer who would spend hours in field thinking about different compositions and techniques to translate her/his vision into pixels. Do we ask an artistic what brush or brand of colors they used to make their beautiful paintings ?! Camera and lenses are just tools a photographer uses to translate his/her vision into an image. The discussion is better done on interpreting the image and trying to understand photographers vision than knowing what cameras and lenses was used to make an image! Do you remember the last beautiful sunrise or sunset image that you have seen recently ? My guess is you don’t ! Why ? There are millions of similar beautiful sunrise and sunset images out there. For this reason I think making a memorable landscape image is not easy. It is not about physically seeing and capturing what is there in front of us. It is about seeing, using our inner eyes and giving it a shape in the form of an image. That is what makes landscape photography an art. Otherwise there is no differece between job of a landscape photograher and an X-ray technician. At the same time it is not possible to define what art is and how to create one ! What is art to me may not be art to you. What is art is an endless debate however we all have our own definition for it !! Black and white photography is not dead! In fact, black and white images may give an artistic appeal to an otherwise mute color version of the same image. During earlier days, people used different kind of black and white films and slides. Thanks to digital revolution, today, we can make an image in color and use image editing softwares like Photoshop to convert color images to B&W. Such softwares also provide us with immense options which mimic traditional development techniques like for example burning, dodging, toning etc. Here is one such B&W conversion from a color image. I have toned it just a bit to give a unique feel. When done for just capturing grandeur of nature for our memory landscape photography can be very simple. All we need probably is a little point-and-shoot camera. If we want to persue this as an art form then landscape photography is as involving as any other stream of art. You decide where you want to be ! Being there at right time matters. The rainbow will fade away in seconds, clouds change their shape in seconds, unique golden light on the mountain peak does not last long. It is better to make one excellent image than hundreds of not-so-good images. Anticipate, wait, wait and wait, be prepared to go home empty handed. Memorable images are not made daily. Best images are also often results of lots of planning and execution. Be prepared to get up at 3am to reach that favourite spot of yours half an hour before sunrise. Try different approaches, different lighting techniques. Be very critical of your own work. Ruthlessly discard images that do not meet your standards. Keep pushing bars very high. Last but not least, don’t imitate others ! Resist that tempation of making a *similar* beautiful image. Make your own instead ! Learn how to take review feedback. Don’t blindly take all views, have confidence in your work. Learn science of photography from others not the art of photography !! Good luck ! Wish you great light for your next outing..